My wife and I wanted to go backpacking over 4th of July weekend...we had a three-day weekend on our hands and no idea where to go. In thinking about options, it dawned on me that my favorite hiking trip was into the Maroon Bells-Snowmass wilderness a few years prior, and that I hadn't really explored much in that area (since there are no 14ers around...which has historically been my motivation for exploration!). 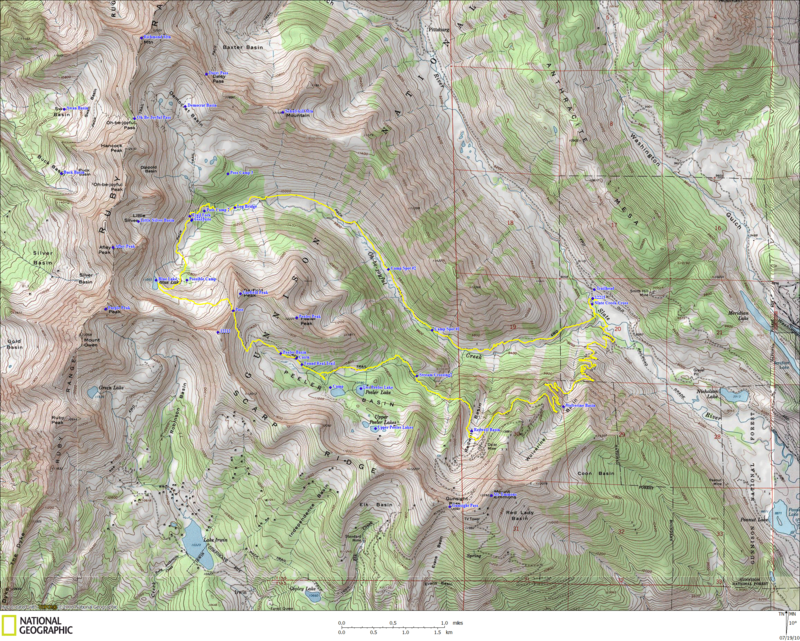 So, after looking at some maps, I settled on the Raggeds Wilderness, located just north and west of Crested Butte, Colorado. I knew that the area was gorgeous as I'd spent some time exploring Kebler Pass and Ohio Pass a few years back. Of course, picking the area was just the first step; next, I had to determine what trails to take. I really wanted to do a loop or shuttle hike so we wouldn't have to double back on our trail - this would allow us to see a continuous changing landscape...unfortunately, it was just the two of us and I didn't trust the idea of hitchhiking back to my car after a long day of hiking - so the shuttle hike was out...that left us with loops. I poured over books and maps and found nothing terribly helpful. Most of my wilderness or camping books just described the wilderness with less detail than I could determine via maps or the internet. The most helpful book was The Complete Guide to Colorado's Wilderness Areas by John Fielder and Mark Pearson which described a handful of hikes, but even that detail was a bit lacking. So, I did what anyone does these days: search the internet! I found a few suggested routes, and I settled on one in particular based on a forum post. The route headed up Oh-Be-Joyful Pass, then followed Daisy Pass Trail away from Daisy Pass up and over an unnamed pass (which I've heard to be called Garfield Pass) next to Garfield Peak, then down into Peeler Basin, connecting up with Gunsight Pass Road back down to the Oh-Be-Joyful trailhead. We left Denver the morning of July 3rd, planning to reach the trailhead and hike in as far as we could make it on that day. We arrived at the trailhead at about 3pm (about 5.5 hours after leaving Denver) and started to gear up. There was a pretty sizeable campground at the trailhead that was full up for the holiday weekend (maybe 20-30 spots?) and a pit toilet. The start of Oh-Be-Joyful trail is a 4WD road which crosses Slate Creek at the very start of the trail. I'd already decided that we wouldn't ford the stream in the vehicle and drive up the road because our loop would bring us back to the trailhead...turns out this was a good plan anyway because the road had washed out and was closed. The Forest Service had the road closed off because about 3 feet of the far bank had washed away due to the fast moving creek. So, rather than putting on our hiking boots at the trailhead, we threw our Crocs on and forded the stream on foot. At its deepest (where we crossed) it came up to our knees but was still very manageable. On the far side we found a picnic table which was a nice, comfortable place to dry our feet and put our boots on. From the campground on the far side of the stream (which was empty because the road was closed) we followed the 4WD road up the hill - in spots, it appeared that the road had eroded quite a bit down the center too, which would make it a bit exciting for most 4WD vehicles. We encountered a large number of hikers coming down for the day - most likely day hikers from the campground. Less than a mile in, we were greeted by our first glorious waterfall on the southern side of the valley, surrounded in lush greenness everywhere. After about 2 miles (1.5 hours) of hiking, we began to round the bend of the valley and could start to see Democrat Basin a few miles ahead of us (and Oh-Be-Joyful Pass); after this point, the valley opened up considerably and the views were astonishing. On the left side of the valley, Peeler Peak and Garfield Peak dominated, and the right side had a lush green ridgeline with Schulykill Mountain topping it off. Oh-Be-Joyful creek ran fast to our left throughout most of the hike until we reached about 4.8 miles in, where we were forced to cross the creek. The creek was too wide to step across, and no rocks offered quick passage - we explored in the trees a bit following a social trail and found a small log bridge to the left of the main trail. This was far preferable to de-shoeing again... Once past on the other side of the creek, another creek flowed over or down the trail occasionally, making a few route obstacles along the way - all quite manageable. A few minutes past the crossing, the trail steepened a bit as it climbed up towards Democrat Basin and wandered through a forested section of the valley. We had started to look for viable campsites, as I was a bit anxious about camping above treeline at the head of the valley, but the terrain was too sloped for any decent site, so we pressed on. We encountered the trail fork at about 5.4 miles; it was marked with a small sign indicating "Slate Creek" with an arrow pointing back down the trail we'd come. At this point, our portion of Daisy Pass Trail was to the left and the route up to Oh-Be-Joyful Pass was to the right. We followed the left path and much to our surprise encountered someone on the trail. The woman was almost as surprised to see us as we her - we hadn't seen anyone on the trail since about mile 2! We popped up and out of the trees on a large flat bench in the basin just below Oh-Be-Joyful Peak. The entire basin was filled with these large stepped benches, each a hundred feet or so above the others. The view from the first bench was amazing - we were surrounded by the valley walls and waterfalls on three sides. We wandered off the trail a few hundred feet over to a small stand of trees and decided we'd found our campsite for the night. The trees offered us a little shelter from weather (plus a place to protect our food from the marmots), but the entire valley felt relatively sheltered against threats like wind and lightning. We arrived at camp around 6:15pm. For the night, we saw no one else in the entire basin - we had it all to ourselves. The only sounds we could hear were those of the waterfalls and some small frogs croaking somewhere in the distance. As an added bonus we saw maybe only three mosquitoes at camp. After a leisurely morning, we packed up camp and set out on the trail at 9:30am. It began to climb up on to the different benches rising up through the basin, crossing a number of streams along the way. Much of the trail was quite marshy from all the moisture, and a few streams took some strategic leaps to cross. After the trail crossed to the center of the valley, it started to climb steeply through another stand of trees; had our camp location not worked out, there seemed to be a few other decent camping spots on these upper benches (although there was more snow in the shadows). The trail jogged westward switchbacking across the basin towards Blue Lake (located on another bench a few hundred feet above us). The trail forked at about 10,900 feet: the Daisy Pass Trail went left, and a spur trail went to Blue Lake up on the right. We decided that, since we were so close, we'd venture off to the right to Blue Lake. Blue Lake is perched above the basin below in one of the many benches of the valley. From the lake shore, you could clearly see out over much of the valley - it was a great view. There was a sign indicating that camping was forbidden within 1000 feet of the lake or stream (which would effectively prevent camping on the bench, since the lake occupied most of the space). There was another small bench tucked back farther in the basin, but we chose not to explore it - we had enough climbing ahead of us as it was! We looked across the valley at the trail leading up to our unnamed pass (between Garfield Peak and Pt. 12,212) - the trail would drop us back down about 150 feet, but we could easily contour across the basin on another grassy bench without losing altitude, so we chose that option instead. Snow fields covered portions of route (both on the upper and lower bench) but a faint trail could still be found periodically, and the snow was easily avoidable. By the time we reached the trail leading up to the Garfield Pass, we'd gone about 1.75 miles and had another 400 feet to climb (over a distance of 852 feet according to my GPS track log...) - the trail was very solid, but as it reached the top of the pass, the steep loose dirt was a small challenge to footing. We popped up on to the top of the pass at about 11am and encountered 2 other backpackers coming up from Peeler Basin. We took a break at the top of the pass and soaked in the views of the surrounding peaks, valleys, and even the distant Elk Range 14ers. After snacking a bit, we began descending down into Peeler Basin. The trail was not nearly as steep as the other side of the pass had been - it descended rather gradually down into the basin below. Not long after we started our descent, the trail became a bit harder to follow. A few small remaining snow fields covered portions of the trail, and a stream was also occupying it in spots. About half a mile from the top of the pass, we lost the trail completely. For all we know, it was under a snow field or the path of the stream, but we had no luck finding it. Based on the amount of moisture where the trail should have been, it's likely that Mother Nature had decided to reclaim the trail - it seemed like this trail was probably much less traveled than Oh-Be-Joyful trail. The trail descended down the basin gradually until we reached the real stream crossing. A cairn marked our side of the trail to provide aid from those coming from Gunsight Pass (probably a more common direction of travel). At this point, we had hiked about 1 hour 45 minutes down from the pass (4.5 miles). The stream, at its current flow rate, offered no practical way to cross without de-shoeing. A few spots were almost crossable (perhaps a week or two later in the year it would be jumpable) but just not quite enough for the leap of faith. We took off our boots, put on our Crocs, and leisurely strolled across the stream. It was not nearly as cold as most mountain streams so it was actually a perfect rest for our aching feet! On the other side, we donned our boots and began steeply ascending the other side of the valley. The trail meandered through a thick forest with more possible camping opportunities (although this side was more mosquito-ey) before eventually popping up into Redwell Basin below Gunsight Pass. From here, our plan was to pick up the road leading down from Gunsight Pass back to our car. We had to ascend a total of 800 feet from the stream crossing in order to meet up with the road - in total, it took us about 1.5 hours from the stream crossing until we reached the road (1.3 miles from the crossing). The road seemed to be a well traveled by 4-wheelers and mountain bikes (we occasionally spotted fresh tire tracks in the dirt). The views of the Oh-Be-Joyful valley (and our trail from Day 1) were amazing. We were perched nearly 2000 feet above our original trail, which offered a great vantage point. Unfortunately, once we rounded the corner and started to descend the rib between Redwell and Wolverine Basin, our views faded away and the route became a tedious slog down a 4WD road. We descended about 2000 feet on the road over the next 3.5 miles (in about 2 hours) occasionally able to take brief shortcuts that saved us maybe a quarter mile of walking each time (most of the time, the sides of the road cuts were far too steep to shortcut). The road surface was very rocky and not very comfortable to walk down - not to mention the sun beating on our necks most of the way. Occasionally, we had a nice view of Mt. Crested Butte, but otherwise the views were just of Slate Creek below. We encountered the only other people we'd seen all day on the road: two mountain bikers descending from Gunsight Pass. 7.3 miles from the summit of the pass (9.2 miles from our campsite) we grew impatient with our route. We'd been hiking for almost 8 hours that day, and it was not clear how exactly we got from the Gunsight Pass trailhead back to our car at the Oh-Be-Joyful trailhead. They were about 0.5 miles apart in the valley: Gunsight Pass road/trailhead had a hefty bridge that crossed Slate Creek and an old railbed seemed to get within a quarter-mile of our car, but then we'd have to bushwhack through willows to get back to the trailhead. After consulting the map, we decided instead to follow a random mountain bike trail that lead north. At some point, we knew this would lead us to Oh-Be-Joyful creek and we would either cross it or drop down into Slate Creek - once we started to ascend again, we opted to drop down into Slate Creek for the last quarter-mile. We pushed our way through the willows on the side of the creek, threw our Crocs on again, then slowly meandered up the creek itself (in and out of the water) with our sore and tired feet. On the western shore of the creek, we occasionally picked up a faint trail which carried us back to our original creek crossing point at the beginning of the hike. In total, our second day of hiking was 10 miles with just over 8 hours of hiking. We reached the car just after 5:30pm. All in all, the hike up Oh-Be-Joyful creek was fantastic, as was camping below Democrat Basin. Day 2, however, was not fantastic. Peeler Basin may have been more interesting had the wildflowers been in bloom, but otherwise it was not nearly as dramatic as Democrat Basin. The views back into Oh-Be-Joyful creek from the 4WD road of Gunsight pass were impressive, but I'm not sure it was really worth the 2.5 hours slog down the road back to the trailhead. If I had to do it again, I'd probably revise this into an out-and-back hike and skip Daisy Pass Trail altogether, or work this into a shuttle hike.